Helping local authorities make informed decisions. The Transport Knowledge Hub is a free online resource. It helps Local Enterprise Partnerships (LEPs) and local authorities make informed decisions when investing in bus, road and rail projects. 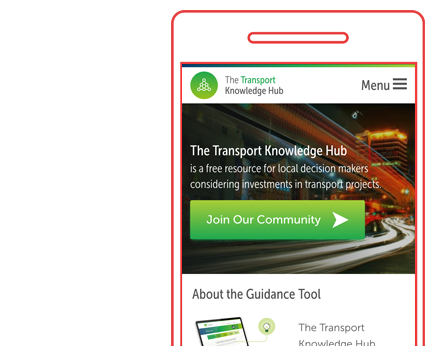 Built as a partnership between national transport organisations and local decision makers, the Transport Knowledge Hub was conceived as a solution to the usual confusing, complex information provided to authorities. It cuts through the fog to provide clear, helpful guidance, a supportive online community and the latest transport news. The Transport Knowledge Hub initially approached us seeking a solution to a widespread problem; local authorities often struggle to make informed decisions about investment, and end up repeating the same mistakes. The existing guidance is fractured and confusing, with no central 'hub' of case studies and shared knowledge. TKH had drafted some guidance that they wished to share online, but were unsure of the best way to present it. Ultimately, they wanted to build a platform to share their knowledge in a user-friendly and accessible way. TKH also wanted to create an active community around it; to encourage knowledge sharing, events attendance and discussion. Our role as designers was to take a complex industry-specific information, and translate it into a user-friendly, open platform. To achieve this, we worked through a comprehensive research phase. We explored lots of different options and approaches, going through lots of rough sketches and 1-to1 workshops with the client and key stakeholders. This helped us develop a robust digital platform that is intuitive and enjoyable to use. Hand-sketched wireframes evolved into quick, iterative wireframes. We then developed these into a fully functioning prototype. The Transport Knowledge Hub required a consistent, distinctive brand that would build recognition. The long-term plan for the Knowledge Hub is to potentially roll out the model to other Hubs - for example, Housing. With that in mind, we developed individual colour schemes that will allow sub-brands to have their own identity that still feels consistent and recognisable. We also developed simple brand guidelines with instructions for fonts, colours and iconography.